3-Dimensional Pharmaceuticals (3DP) was a biotechnology company that I founded in 1993. The earliest members of our team included Dimitris Agrafiotis (computational chemist) Roger Bone (protein crystallographer), Scott Horvitz (CFO), Jim Myslik (newly graduated from Princeton), and Richard Soll (medicinal chemist). In 2000, the company went public on NASDAQ (DDDP) and ultimately was acquired by Johnson & Johnson in 2003. The scientific rationale behind 3DP was to couple the precision offered by structure-based drug design using X-ray crystallography, with the synthetic parallelism potentially accessible using combinatorial chemistry. By the early 1990’s, several groups were guiding the synthesis of drug candidates and related molecules using X-ray crystallography to visualize the atomic structures of synthetic compounds bound to a target enzyme active site. Enhancement of binding properties followed an iterative process that required close collaboration between synthetic chemists and protein crystallographers. Practical synthetic considerations required compromises in the compounds synthesized, and despite the extensive use of computational methods to estimate potential enhancements in ligand binding affinity, actual results sometimes varied widely from expectation. In addition, a design process focused on increasing potency generally failed to consider or incorporate additional drug-like properties (e.g. ADME-Tox) that would ultimately be required for successful clinical development. During the same period, rapid advances occurred in robot-assisted high-throughput screening technology that, in turn, engendered developments in high-throughput synthetic chemistry methods. The concept behind combinatorial chemistry is outlined in the first slide taken from a 3DP presentation in the early 1990’s. The basic idea is to use the same chemistry together with a range of different reactants to produce a range of different products. Although a variety of approaches were commonly labeled combinatorial chemistry, methods of implementation were quite varied, ranging from mix-and-split synthetic methods to robot-assisted parallel synthesis. The question that immediately arises is which compounds should be made, since even relatively simple reaction schemes can potentially produce libraries of hundreds of millions of compounds that would clearly be impractical to physically synthesize. In the context of the structure-based drug design question, the answer "which compounds to make" was simple. The structures to be synthesized should be the ones that fit the steric requirements of the target binding site and provided the greatest number of energetically favorable interactions (e.g. hydrogen bonds, etc.). In addition, compounds to be synthesized should, as far as possible, possess physical and other properties that were characteristic of compounds successfully developed as drugs. 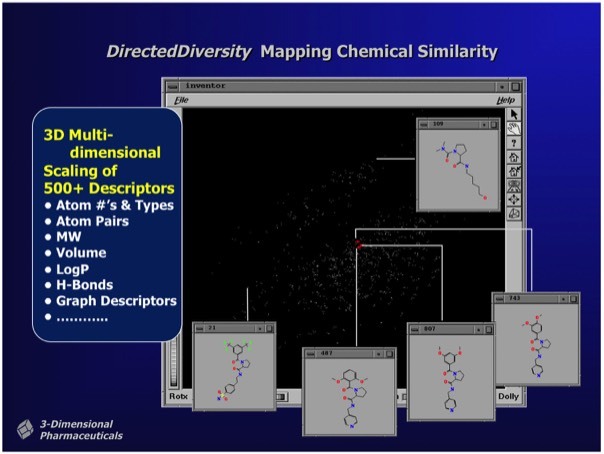 3DP developed a comprehensive cheminformatics platform called DirectedDiversity (DD) to organize and direct combinatorial chemistry synthesis and to integrate combichem into the overall drug discovery process. 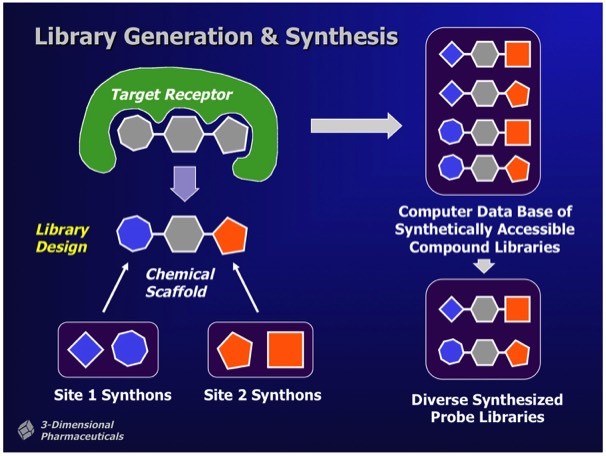 At that point in time, it was generally recognized that first generation combinatorial libraries tended to produce a high proportion of compounds with “non drug-like” properties. 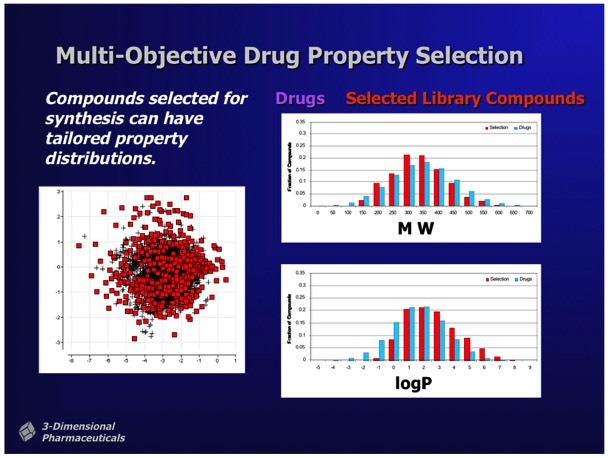 Consequently, a key requirement of DD was to develop compound libraries and computational selection procedures that insured the production of compounds with drug-like properties. 3DP’s DD computational platform was built by a team headed by Dimitris Agrafiotis, who had been recruited to 3DP in part owing to his contributions to the development of the LHASA retrosynthesis platform at Harvard. Combichem library development often focused on a specific target class. For example, a serine protease focused library could be designed around a non-peptidic scaffold that provided two attachment points with proper geometry for substituents fitting into the protease S1 and S1’ specificity subsites. Well-designed libraries can produce millions of alternative compounds, which the DD system stored as Virtual Libraries. Computational tools were used to select compounds for synthesis and inclusion in a Probe Library, comprising a diverse subset of the complete library. Synthetic chemical experiments performed in parallel with computational Virtual Library enumeration insured reliable on-demand synthesis for combinatorial library members. The DirectedDiversity system incorporated novel 3D “star map” interfaces allowing the interactive visualization of virtual compound libraries mapped using multidimensional scaling methods. Maps were interactive to immediately show chemical structures underlying each point in chemical property space. Multivariate selection tools allowed the selection of sublibraries conforming to preselected property distributions. For example, selection of a chemically diverse sublibrary could be made subject to the constraints that the compounds selected for sublibrary synthesis statistically conform to the MW and logP distributions observed in a collection of marketed oral pharmaceuticals. 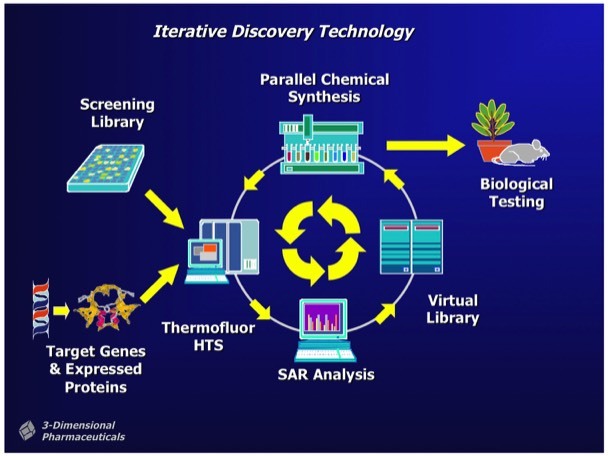 Active hits identified from screening Probe Libraries could be rapidly followed up using automated parallel chemical synthesis to generate analogs using the DD interfaces and associated reagent management and synthesis preparation tools. Multi objective optimization tools could be applied during analog selection to help optimize downstream development properties independently from SAR parameters applied in the selection process. 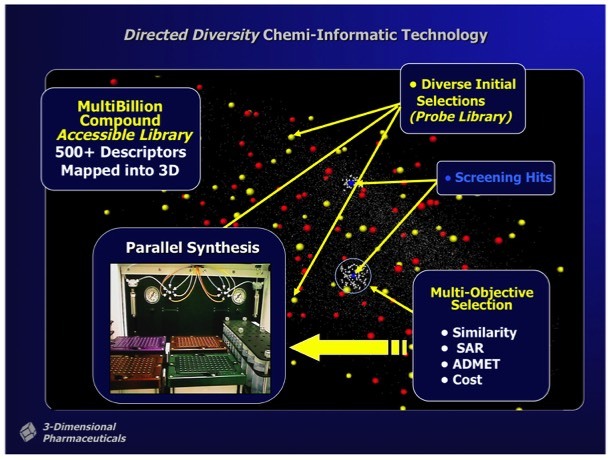 3DP developed the DirectedDiversity cheminformatics platform to support all aspects of drug discovery, in order to support an efficient drug discovery and optimization process. 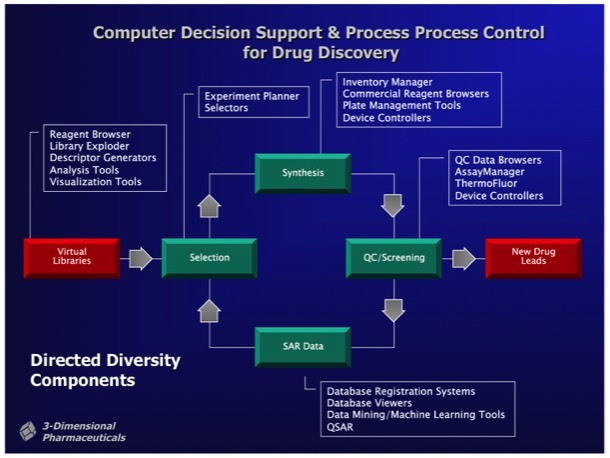 The DirectedDiversity software platform integrated several computational and database modules both to support focused parallel chemistry efforts and to capture and store data generated throughout the discovery process. 3DP ultimately achieved success in implementing an SAR-directed, closed-loop optimization process that used Thermofluor HTS and DirectedDiversity combichem technology to rapidly discover and optimize new drug leads for preclinical evaluation. The implementation required substantial efforts to insure the purity of compounds synthesized using combinatorial chemistry methods, and required the development of significant resources for compound purification and analysis to support libraries containing hundreds of thousands of discrete compounds. In the event, the system was found most effective for early lead discovery and optimization. Although combichem was an excellent tool for the creation of screening libraries and early lead optimization, it proved difficult to replicate the fine-grained chemical variations ultimately required in the end game of drug lead optimization. Links are provided below to DirectedDiversity Operating manuals developed by Dimitris Agrafiotis and his team at 3DP. These documents provide a wealth of information about modern methods of cheminformatics and their application to the drug discovery process.